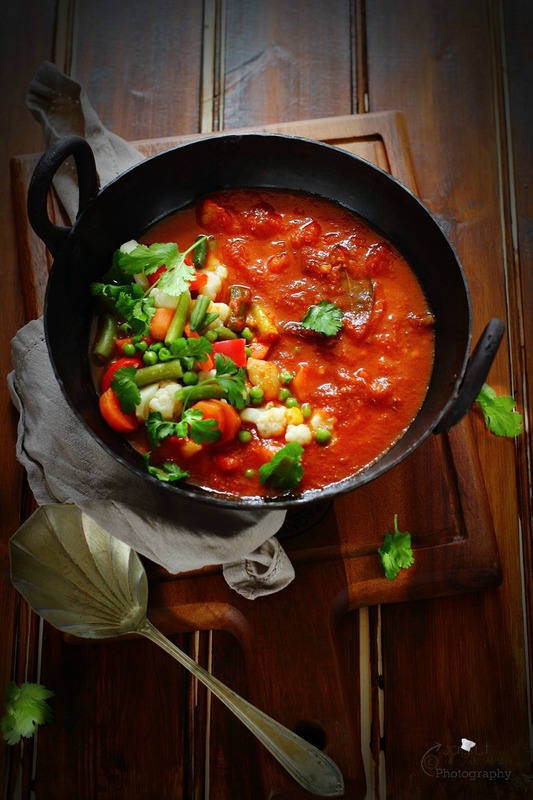 Sabz Khada Masala , fresh and colourful vegetables cooked with whole spices and in a tomato gravy. It's not rich, but light and flavourful dish and should be served on a special occasion. My great grand father used to say this for laughs whenever there was a get together in the house, ' Masale ka kaam, Bahu ka Naam' ! One can not think about Indian cuisine without Spices even in their wildest dream, It's IMPOSSIBLE !! !Spices and herbs are used abundantly in Indian cooking, whether it's a combination of spices, such as blended or whole makes an ordinary meal to extra ordinary and enhances it's flavours. Today I want to share a recipe which is inspired by the cooking style practised during the Mughal era. Mughlai food is known for it's curries, and famous for the use of exotic spices. Mughlai dishes have a distinct aroma and taste of ground and whole spices. Last but not least Mughlai cooking not only teaches you how to cook amazingly delicious food, but also teaches patience in cooking. 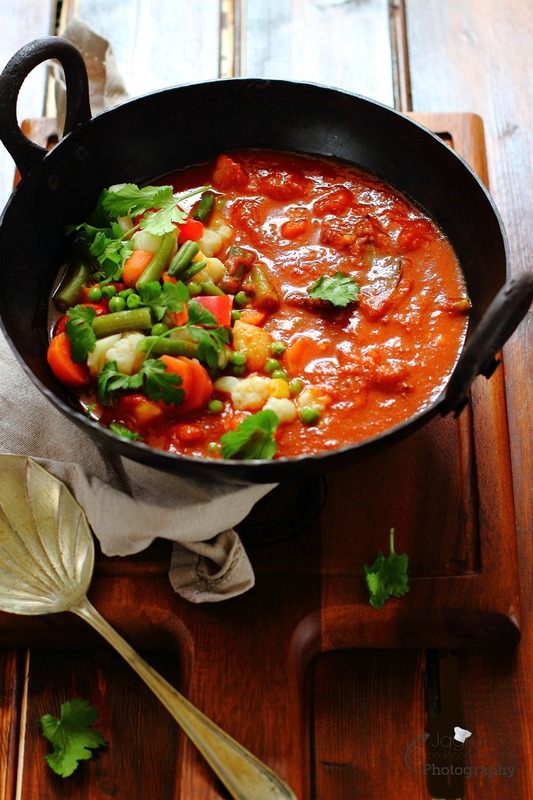 The strong flavours of whole spices work amazingly with fresh vegetables, grains and legumes. Khada Masala Bhaat ( Rice ) was magnificent I have used all the vegetables fresh, but one can use frozen mixed vegetables. 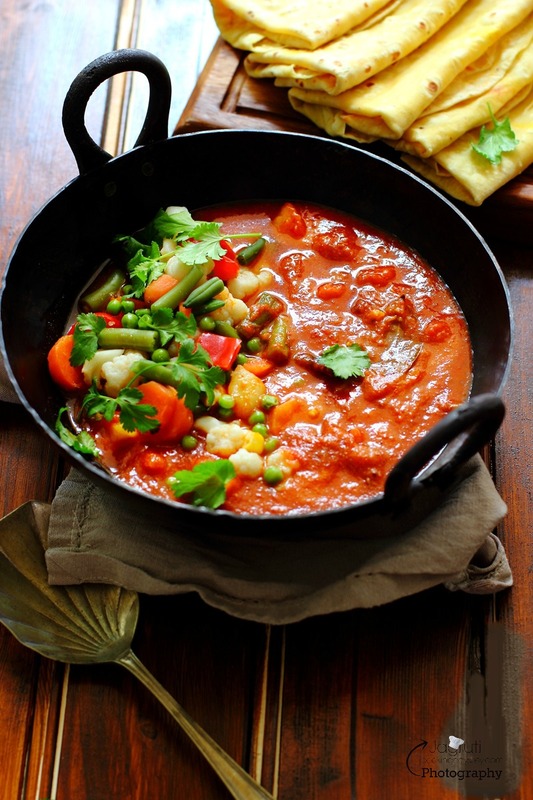 Fresh carrots, cauliflower, green beans ,fresh peas and potatoes are used for this delicious and tasty curry, but feel free to replace or mix and match different vegetables or add paneer or tofu and create a whole new dish. The family are always up for these kind of curries, and especially when daughter is at home always there is a lot of hustle and bustles in our kitchen as almost every other day she would ask for these kind of scrumptious , flavourful and exotic curries. To make red chilli paste soak dry red chillies in hot water for half an hour , then grind into fine paste. To make brown onion paste, fry chopped onion in a very less oil until nice and brown, once cooled down grind in a grinder without water. 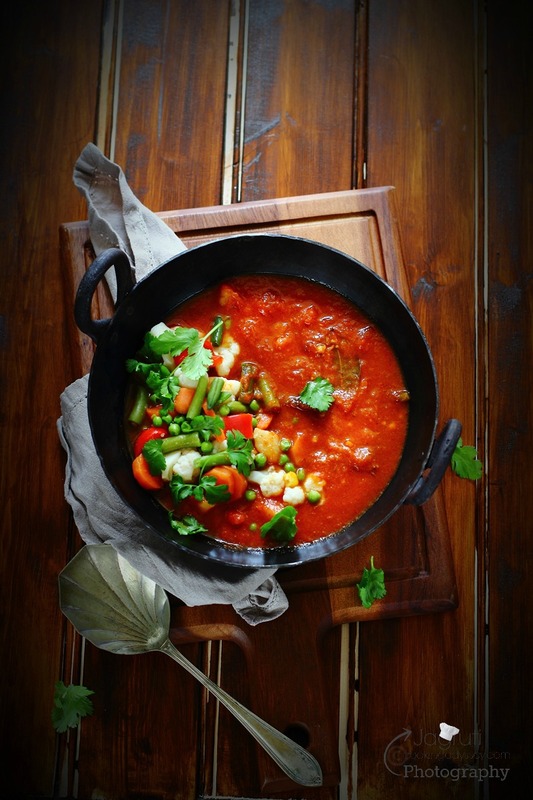 Fresh and colourful mixed vegetables cooked with Whole Spices and in tomato gravy ! Once vegetables are boiled, drain all the water and leave it aside. Heat oil or ghee in a kadai, add cumin seeds and left over whole spices. Once they start crackling add ginger garlic puree. Sauté for few seconds, then add onion paste. Cook the mixture for another couple of minutes. Now add tomato puree and turn the heat high.Start adding all the ground masala ,red chilli paste, kasoori methi and mace powder. Keep stirring and cook on high heat.Once you see oil separating, add vegetable stock which we reserved from the boiled vegetables. Mix and add little salt.Cook the gravy for another couple of minutes, then add par boiled vegetables. Cook the vegetables about five minutes on high heat. Turn off the heat, garnish curry with fresh coriander leaves. 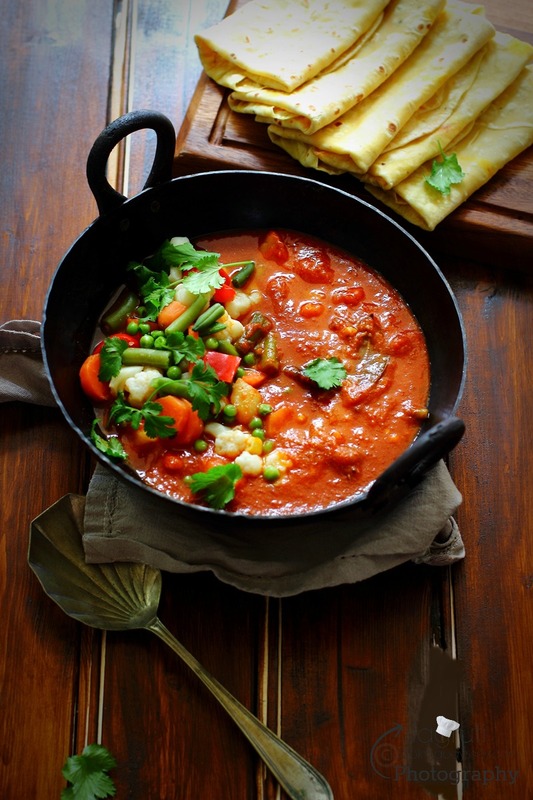 Serve hot with salad, Roti, Naan or Paratha. Linking this recipe to Meat free Mondays . Looks yummy Jagruti. Love the colours. This looks delicious! 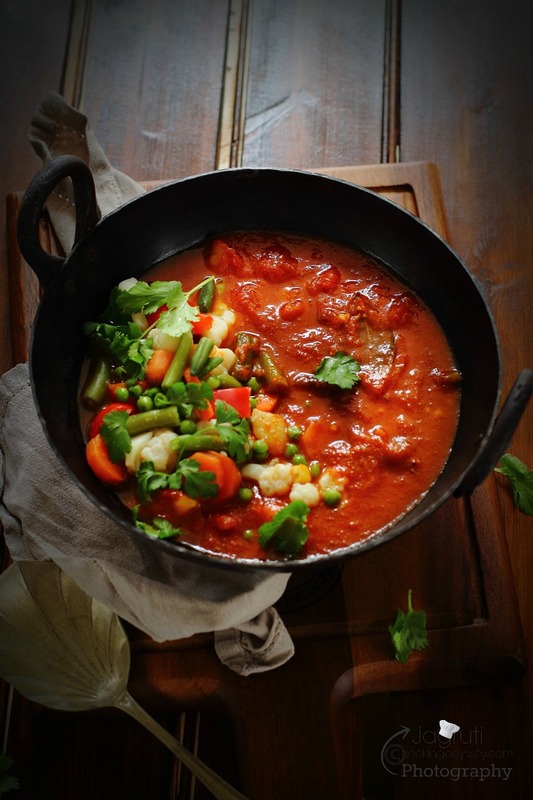 I love that it's so hearty and flavorful without needing any meat too. So packed with veggies & spices! This sounds delicious, and your photographs are absolutely beautiful! I love the light and all of the vibrant colors! I love all of the colors. This looks so healthy. WOW - what a gorgeous, gorgeous dish this is! So many veggies - and so much flavor! I am so mesmerized by that color! Delicious!